On September 17th I'm giving the first talk on my Scottish Watershed Walk in Tarbert at the Isle of Harris Mountain Festival - probably as remote from the Watershed as you can get in Scotland! The Festival lasts from the 14th to the 21st September and includes hill races, raft races, barefoot walks, non-barefoot walks, kayaking and surfing. Leading natural history photographer Laurie Campbell will be leading a photo workshop and also giving a talk entitled 'From Paxton to Patagonia'. There's also a talk from Cameron McNeish - 'A Wilderness Walk with John Muir'. There's much more too - see the Festival website for details - and of course there's beautiful Harris with its splendid beaches and remote hills to explore. BBC Radio Scotland tomorrow - interview about the Cairngorms in Winter film. 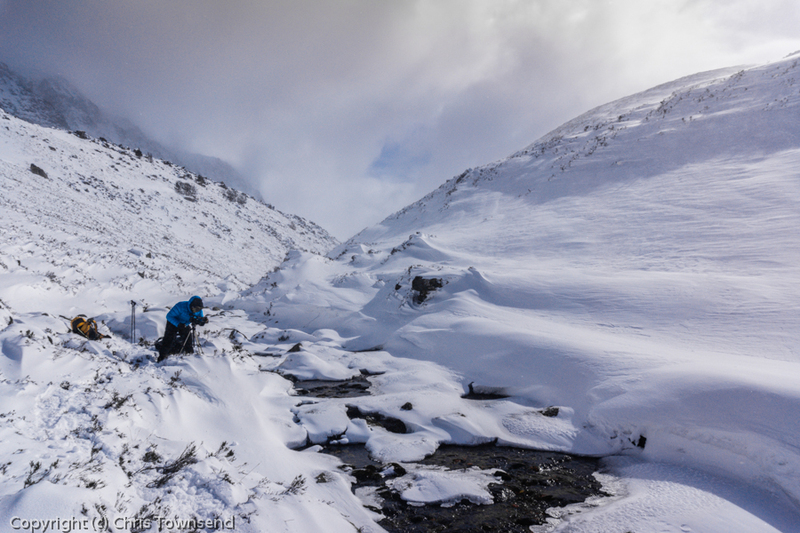 A few days ago I was interviewed for the BBC's 'Out of Doors' programme about the Cairngorms in Winter film. The interview will be broadcast this weekend - the show is on from 06.30 a.m. on Saturday and 11.05 a.m. on Sunday. Then it'll be available on 'Listennow' for a week. The interview was around 15 minutes long. How much will be broadcast I don't know! Motorbikes, leather jackets, tattoos and loud rock music are not the usual accompaniment to the start of a walk in the hills, especially at a high ski resort car park. 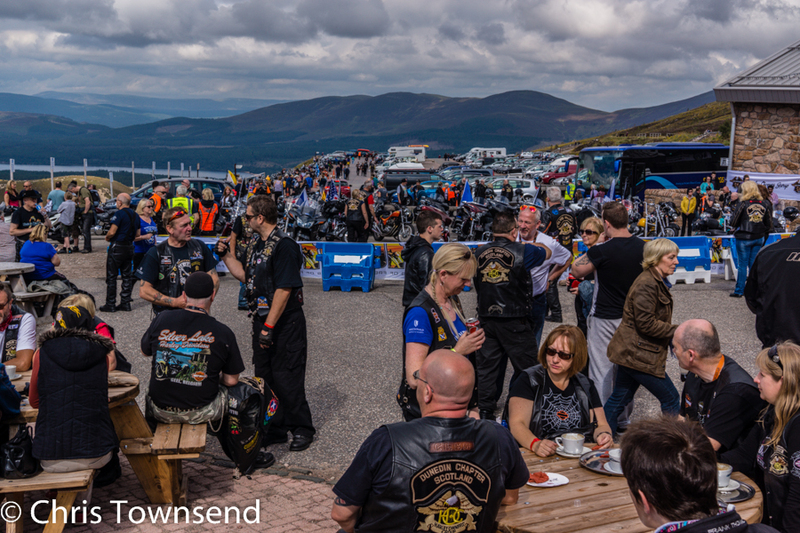 That was the case in Coire Cas in the Cairngorms though, the reason being the annual ‘Thunder In The Glens’ Harley Davison motorbike rally, which brings thousands of bikers to Strathspey. I’d passed slowly through an Aviemore heaving with bikers and bikes, many shops draped with huge Harley Davison banners (the most incongruous being the one filling half the window of the Red Cross charity shop with a white wedding dress in the other half) but I hadn’t realised they came up into the hills. Leaving Coire Cas to the sound of revving bikes and Black Sabbath’s Paranoid I headed up to the Cairngorm Plateau. 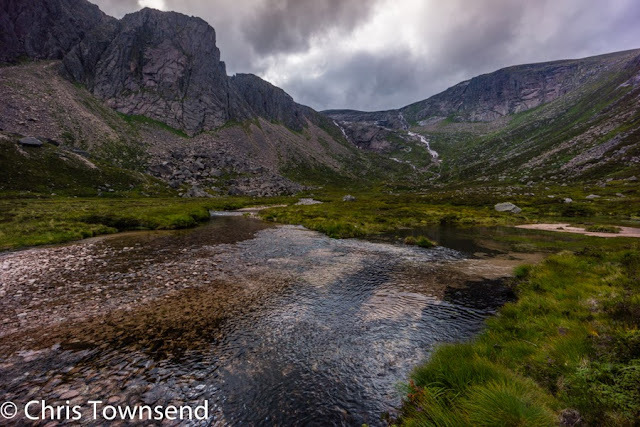 I could hear the bikes all the way up but once I dropped down slightly into shallow Coire Raibert the noise vanished, leaving just the gentle trickle of the burn the only sound. In the upper part of the corrie a work party was repairing the eroded path with big stones. Further down I could see animals grazing. Used to human beings the semi-domesticated reindeer paid little attention to me and I was able to walk right through the herd. It’s always a delight to come across these reindeer, which range widely over the Northern Cairngorms, a reminder that this is a northern sub-arctic landscape. At the lip of the corrie I took the steep, rocky path that follows the burn down to Loch Avon, one of the most spectacular places in the Cairngorms and my destination for the day. Situated in a deep narrow trench the long loch is surrounded by steep rocky hillsides with massive cliffs at its head. I’d looked down on the loch earlier in the year when filming the ‘Cairngorms in Winter’ but we’d not found time to descend to it. I like to do so at least once every year, often camping there at least one night. This was a day trip only but I had allowed time to sit and stare, revelling in the great rock architecture, the crashing streams and the overwhelming sense of wildness. I wandered along the lochside and then beside the stream at its head below the huge rock buttresses of Carn Etchachan and the Shelter Stone Crag. High on the latter two rock climbers were inching upwards, their tiny forms dwarfed by the massive, fractured wall. 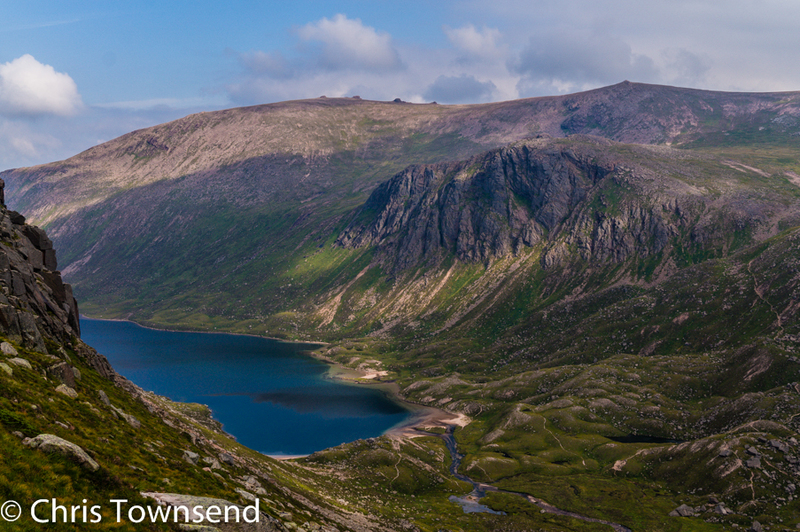 Leaving the Loch Avon basin I climbed steeply back up to Coire Domhain and the Cairngorm Plateau. The effort of the ascent was eased by turning back frequently to gaze over the splendid scene I was leaving. Again the roar of a tumbling burn, tearing down in cascades and water slides, accompanied me. A final walk over Stob Coire an t-Sneachda and then a descent to a now quiet and almost empty Coire Cas finished a fine day out. 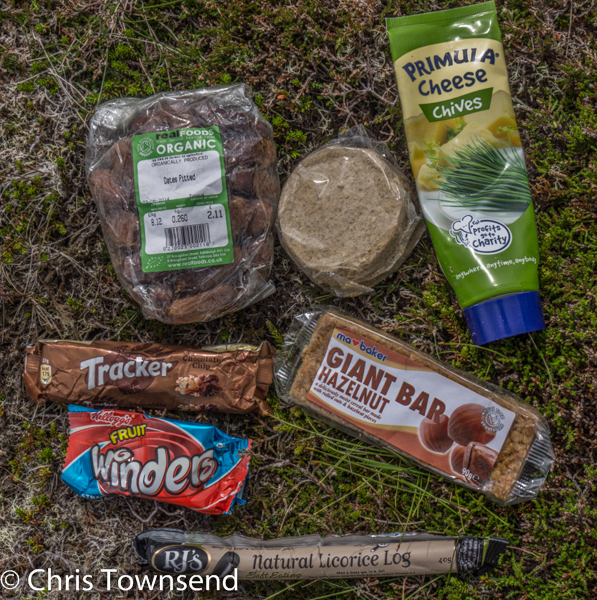 A few people have asked me what I ate on the Scottish Watershed Walk and how I resupplied with food. The answer is that mostly I bought food in shops along the way (my family did send me one parcel of tasty organic food from Real Foods in Edinburgh). Specialist backpacking foods can be convenient but they are expensive and have to be bought in advance and then posted ahead. Buying food in shops on or near my route was simpler and cheaper. (And also supports local communities). The picture above shows a weeks supplies purchased at the village store in Crianlarich. All that's missing are some sachets of hot chocolate. 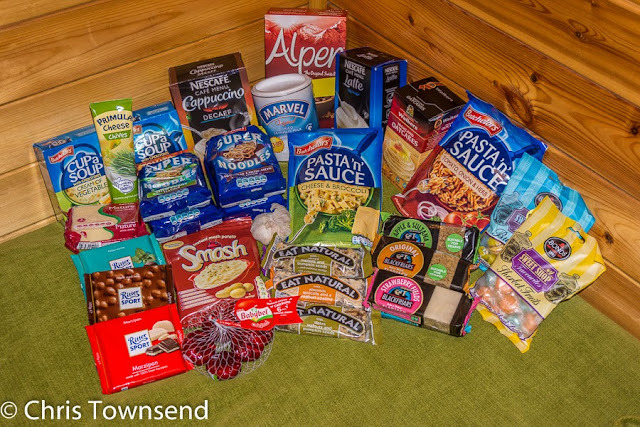 Of course this involves some compromises and occasionally buying items that aren't that tasty (the latte sachets pictured above were pretty horrible) but overall I've been happy with this method of resupply, which I've used on other long walks including the Pacific Northwest Trail. 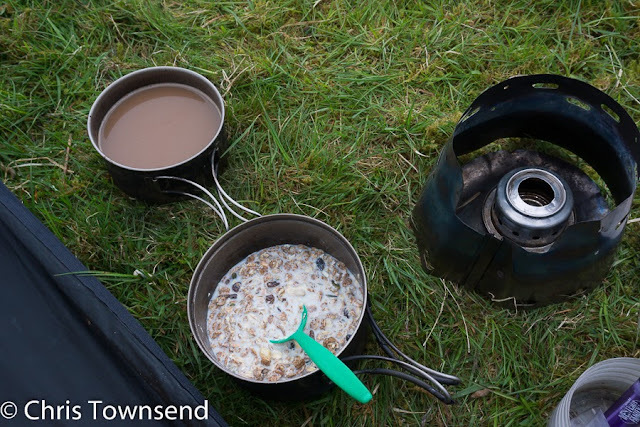 Above is my standard backpacking breakfast (and actually my standard breakfast at home too, though with fresh milk) - muesli (about 125 grams) with dried milk and sugar plus coffee (decaffeinated if I'm feeling awake, caffeinated if not) and dried milk. That's enough to keep me going for a few hours. The picture also shows my stove and my two titanium pots - 600 and 900ml size. During the day I snack regularly rather than have a big lunch. Oatcakes, cheese, flapjack, chocolate, dried fruit, nuts grain and fruit bars, boiled sweets (good for dry throats) all find their way into my pack. 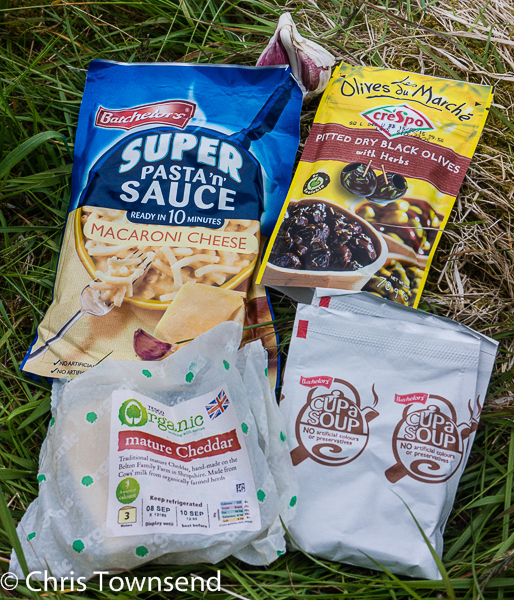 The picture shows a day's snacks - though the dates and cheese spread would last several days. Here is a typical evening repast. Two packets of Cup-A-Soup to start (good for restoring liquid and salt) then a dried pasta meal with added cheese, fresh garlic and, in this case, olives. If I have enough cheese and garlic I'll add some to the soup as well. Other flavourings I sometimes carry are dried herbs and spices such as chilli powder. Immediately before going to sleep I'll have a mug of hot chocolate, made from two sachets. I don't know how many calories this diet supplies but I never ran out of energy on the Watershed Walk though I did lose 9 kilos in weight. The Cairngorms In Winter film has its Scottish premiere at 8pm on Wednesday August 28 at Eden Court in Inverness. I'll be there for a Q&A session afterwards. The September issue of The Great Outdoors magazine has just appeared. My backpacking column, headed 'From storms to drought on the Scottish Watershed', covers the second half of my walk, which I finished just a month ago. In the gear section I review 12 pairs of hiking trousers, including the ones I wore on the Watershed (as pictured above), which, unsurprisingly, are my Best Buy. Also in the gear pages are reviews of six backpacking rucksacks by John Manning, six trekking poles by Cameron McNeish, two insect repellent shirts by Daniel Neilson and the Big Agnes Copper Spur UL2 tent, also by Daniel Neilson. The big feature in this issue is by Mark Richards, author of the Lakeland Fellranger guidebooks, and covers less popular ways up Lake District hills. Elsewhere Mark Gilligan talks to Terry Abraham about his forthcoming film on Scafell Pike; Simon Yates answers questions in a feature called 'My Hills'; Jon Sparks looks at the Eiger; also in the Alps Ed Byrne fails to climb Mont Blanc; James Reader goes scrambling and camping on the gritstone edges of the Peak District; Keith Fergus describes the River Tweed and its attractions for walkers; Aaron Millar follows a sea kayak route up Scotland's west coast; Roger Smith comments on the HS2 high-speed rail link; and Jim Perrin praises C.E.Montague's The Right Place (a book I've not come across before). The Hill Skills section has a good illustrated guide to wading birds by the RSPB's Grahame Madge; David Lintern on pack rafting and safety advice on river crossings by Mark Chadwick of Glenmore Lodge. June 5. Morning. Camp with Tony Hobbs below Lochraig Head in the Southern Uplands. June 22. My second camp in very stormy weather on the bealach between Ben Oss and Ben Lui. I moved my first camp at midnight as the wind threatened to rip the Trailstar off the mountain. This camp was 50 metres lower. Still very windy but sheltered enough for me to get some sleep. July 10. Just out of the cloud in the Fannichs. Sgurr Mor in the background. July 14. In Rhidorroch, above the Clar Lochans. July 16. Above Gorm Loch Mor in Assynt. July 21. Last camp. In the vast expanse of the Flow Country. Whilst returning home from the Scottish Watershed Walk has meant dealing with the inevitable mass of emails, paper mail, phone calls and other desk stuff one of the delights has been watching the red squirrels in the garden. These are in their bright summer coats now and really living up to their name. On the Watershed I saw much wildlife - black-throated divers, golden eagles, hen harriers, peregrine falcons, badgers, red fox, deer and more - but the only squirrels were grey ones in the Central Lowlands so it's been good to watch our red ones again. In the August issue of The Great Outdoors, in the shops now, I review thirteen new waterproof jackets, including the Rab Myriad that I wore on the Scottish Watershed Walk. The latter also features in my backpacking column, which I wrote on my tablet in a hotel room in the Great Glen halfway through the walk. This issue also features some great photographs: a wonderful atmospheric picture of the Langdale Pikes by Stewart Smith and an even more atmospheric and moody picture of Loch Lomond by Damien Shield. Elsewhere David Lintern interviews Charlie Ramsey on the 35th anniversary of his run over 24 Munros in 24 hours, known as Ramsey's Round (which took me four days on my continuous Munros and Tops walk); Keith Fergus looks at the Loch Lomond and the Trossachs area in literature from Sir Walter Scott to Alastair Borthwick; Cameron McNeish explores the spectacular far North-West of Scotland; Daniel Neilson visits the Val Venosta in the Alps and Jim Perrin praises Dorothy Pilley's Climbing Days. There's a big feature on walking and camping with kids by John Manning and the Hill Skills section has more on this. In the gear section Daniel Neilson reviews six knives and multi-tools; Geoff Barton tries the Thule Perspectiv Day Pack camera bag and David Lintern tests the unusual Therm-a-Rest Altair sleeping bag. 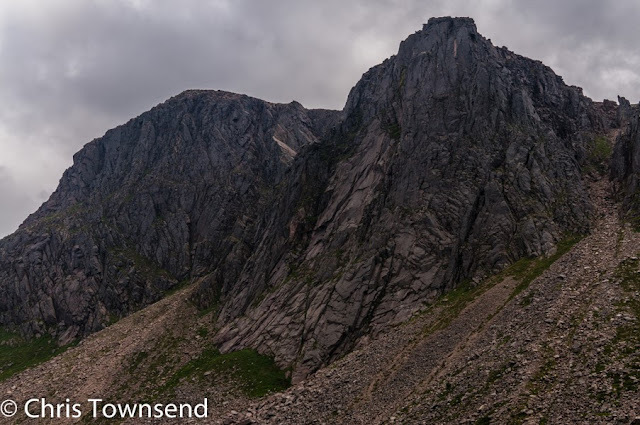 David Lintern also pops up in the Wild Walks section with an excellent piece on an ascent of Bruach na Frithe on his first visit to the Cuillin. The July Great Outdoors came out while I was on the Watershed Walk and I didn't see it until I returned home. It has my review of fourteen three-season sleeping bags, including the Rab Infinity 300 I used on the walk, plus my first report on the walk, sent from Moffat. Daniel Neilson reviews hydration reservoirs and filtration systems (neither of which I took on the Watershed) and also the Fjallraven Keb jacket and trousers plus the Komperdell Ultralight Vario 4 trekking poles. 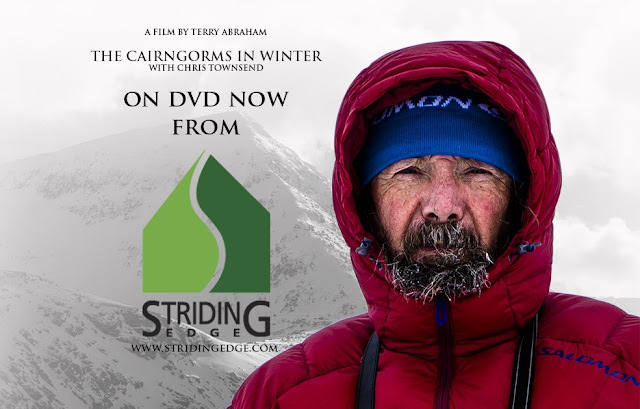 There's also an interview with Terry Abraham about the Cairngorms In Winter film, with a short bit from me about still photography, and a review of the film by Andy Howell. The Hill Skills section is mostly about photography too with advice from photographers Ray Wood, Mark Gilligan and Chiz Dakin. Elsewhere Carey Davies spends midsummer night on Suilven; Mark Gilligan looks at Lakeland tarns; Ed Byrne learns about rescue dogs; Paul Beasley looks at the impact of military training on Dartmoor; photographer Ray Wood records a scramble in the Carneddau with an iPhone and Jim Perrin praises Showell Styles' The Mountains of North Wales. Returning from a walk on the Cairngorm Plateau under overcast skies I sensed a lightning of the clouds as I drove past Loch Morlich so I stopped and strolled down to the shore. Thin clouds were reflected in the gently breeze rippled water and although the sun had set the sky to the north was brightening rather than darkening. Within a few minutes the clouds were turning orange and pink, colours that rapidly intensified to create a glorious scene. Then, after less than a quarter than an hour, the light faded and greyness returned. But for a while it was wonderful, a brief flash of colour on an otherwise subdued day.